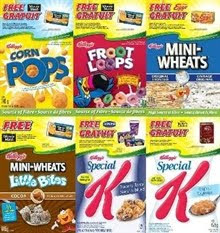 Now you can Wake up to a FREE Breakfast by collecting 5 FREE product coupons inside specially marked packages of Kellogg's* products. Offer is good till 09/30/11. - FREE Kellogg's* Eggo* Waffles: Redeem towards 1 box of Kellogg's* Eggo* 8 count Waffles up to a maximum value of $2.99. Offer excludes Family Pack and Jumbo Sizes. - FREE Nescafé® Taster's Choice: Redeem towards 1 box of Nescafé Taster's Choice Classic or Decaf (6 x 2.3g package) up to a maximum value of $4.99. Should this product not be in stores, coupon can be redeemed towards a package of Nescafé Cappuccino or Latte. - FREE Minute Maid® Frozen Juice: Redeem towards (1) 355 ml Minute Maid® Frozen Concentrate up to a maximum value of $1.99. - FREE Danone® Yogurt: Redeem towards a Danone® Activia probiotic yogurt tub (650 g), Silhouette 0+ yogurt tub (650 g), Crush (8 x 100 g) or Coolision (6 x 60 g). Up to $4.99 value. Great coupons stuff. Thanks for sharing!